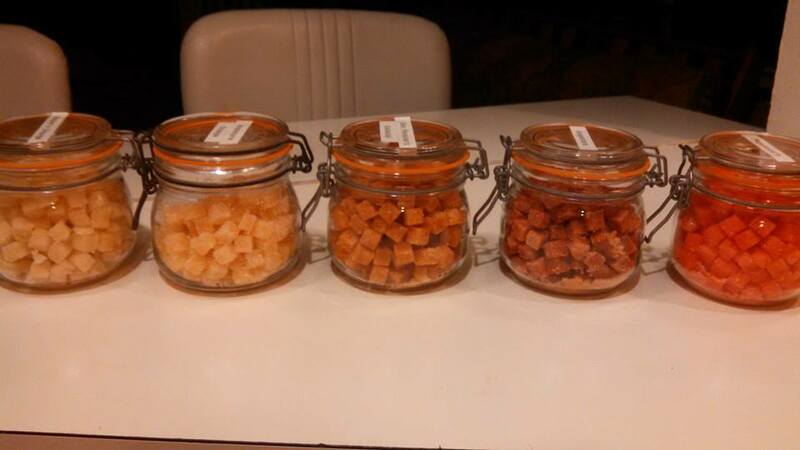 Bitters Cubes are sugar cubes flavored and colored with cocktail bitters. They are very easy to make, and great to have all ready for the Champagne Cocktail (just drop two into a champagne flute and add champagne or any sparkling wine. Wait for them to dissolve, and stir gently), Old Fashioned’s, or other cocktails. Assorted types of bitters- Angostura, Angostura or Regan’s Orange, Peychaud’s, etc. In a mixing bowl combine 1 cup sugar, and 1-3 Tablespoons of one type of bitters, and mix until blended thoroughly. Put in silicone tray/mold and using a spatula or the back of a spoon press down firmly as possible into the mold, removing any excess. There are several ways to get these to set and harden. I found the best way for me was using the microwave, but you have to be careful not to overcook them. The oven method you can sometimes overcook as well and lose aroma and taste. The non-cook method can work out well, but sometimes takes several days depending upon the humidity. Try all three and see which you like best. Then either place into a 250F heated oven for 30-60 minutes. Microwave at 50% power for 20–30 seconds, then let cool and set for several hours. You can let the molds sit out overnight to dry and harden. (Up to 2-3 days in high humidity.